Agbeko displays his killer punch while H.E. Mr. Isaac Osei (Left) and Mr. Freddie Annan (Right) Agbeko's Manager and Executive Director of Base management) look on. 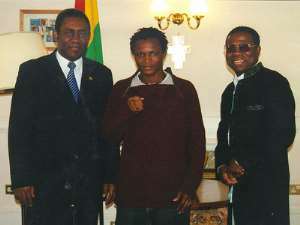 AGBEKO FIGHTS FOR WBA BANTAMWEIGHT TITLE Joseph Agbeko, Ghana's former WBF Bantamweight champion will fight Wladimir Sidonrenko, holder of the World Boxing Association International Bantamweight for his title on Tuesday May 18th 2004 in Lubeck, Germany. Affectionately called “Kingkong” for his persistence and powerful punches, Agbeko has knocked out 20 of his opponents in his last 22 fights. The former WBF champion said that he had undergone an intensive training programme and mapped out a special strategy that would enable him wrestle the title from the champion. On his part the High Commissioner assured the challenger of the “support of the Government and People of Ghana" and urged him to do his " best to bring honour to himself and his country”. Mr. Osei praised Agbeko for his enviable record and expressed the hope that the high sense of discipline and commitment which he continued to show would inspire other Ghanaians to emulate his example. Present at the meeting were Mr. Freddie Annan, Executive Director of Base Management, managers of Joseph Agbeko and Mr. Fritz Andoh, Minister Counsellor of Information at the Ghana High Commission, London.